Rescue workers had to resuscitate a man who collapsed in the middle of President Obama's commencement address at a Michigan high school Monday night. Kalamazoo, Michigan (CNN) - Rescue workers had to resuscitate a man who collapsed in the middle of President Barack Obama's commencement address to a high school graduating class Monday night. 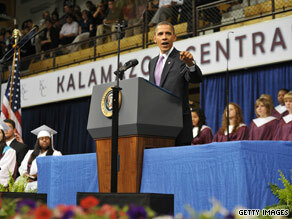 Obama was midway through the speech to graduates of Kalamazoo Central High School when witnesses say the man collapsed in the lower bleachers of Western Michigan University's arena where the event was held. Paramedics and a local politician who is a doctor rushed to help the man. State Senator Tom George, a practicing physician and former medical director for Hospice of Greater Kalamazoo, told CNN affiliate WOOD he was a few rows in front of the man when he heard a "commotion". Audience members fainting at presidential events, often in hot, crowded, rooms is not unusual. But spectators were surprised when this turned into a much more serious medical emergency. "He was not breathing and he was pulseless", George said. Rescuers could be seen repeatedly pumping the victim's chest in the crowd, while the speech continued. A stretcher was then brought, and he was wheeled to a waiting ambulance. Medics told a pool reporter outside the area the man had been revived, and George told WOOD the victim was responding to treatment. He was taken to Bronson Methodist Hospital in Kalamazoo, but there was no word on his condition. I can totally understand – I have seen President Obama on several occasions in person now, and nearly fainted from seeing & listening to him, because he is so awesome! Praise God for the people being there that had the expertise to help this precious soul. I watched the graduation and had no idea that anything went wrong. I know that the students will never forget their graduation. It was amazing what this school has accomplished. What is even a greater achievement is to have someone recognize the hard work and achievement of the students and the great community. May God bless the man, bring him to a complete recovery, and protect the class of 2010. I hope the man is okay. We should all pray for his well being. My good wishes to this gentleman that he may make a speedy and full recovery!